Most people involved in politics in any way would probably agree with me that it’s not a happy place to be at present. Whatever political colour, the national Parties are struggling with their own difficulties, and with Brexit dominating the Parliamentary agendas and the news media. What’s being forgotten, with all the heat that’s on, is that local authorities are having to make contingency plans for all possible eventualities to ensure that they are ready for the fallout from any deal (or none) that is finally agreed. It may turn out to be a repeat of the efforts made to address potential problems with the Millennium Bug but none of us know and councils will be first ports of call for local people experiencing difficulties of any sort.I was a Remainer. The EU certainly needs reform but, in my view, our membership has brought many benefits to this country, most unseen and unacknowledged, on workers’ rights, the environment and crime for example. It’s also ensured peace in Europe in our time: not a fatuous comment but one that I genuinely feel. That, in a sense, is now history and the future will tell. However, I just want them to get on with it now. Any second referendum would, in my view, be saying to people that their first vote didn’t count, a dangerous path to follow.Votes do count. While councils are preparing to pick up the pieces post-Brexit, they are also preparing for local elections on 2nd May to District, Borough and Parish Councils. These elections are important for our local services yet, on average, the turnout is always far lower than for national elections, about 30% compared to over 70% for national elections. Councillors attract far higher levels of trust than MPs do and, in the main, deservedly so. At a time when people are being turned off national politics, I genuinely hope electors will look closely at what local candidates stand for, ask questions, test them out, challenge them even but then go out and vote. Is there such a thing as a L-turn as opposed to a U-turn, a partial change of direction rather than a complete reverse? A turn of any sort can be a good thing if it signals a genuine change of heart and I, along with the thousands of residents who signed petitions and campaigned against the proposal by Staffordshire County Council to axe funding for School Crossing Patrols, welcome the policy change on future funding. Our Lollipops have been saved, for the time being at least. I don’t think this was so much in response to the 300 or so comments in the recent consultation, as we are told, but far more about people power across the county. If enough people are shouting, councillors just can’t ignore them. The Labour Opposition has called for a full and transparent review of Crossing Patrols. The future of our Lollipops certainly shouldn’t be about “natural wastage”, a horrible term that would see retiring patrols not replaced, but about meeting local needs. A review might lead to changes – one road I use regularly has three patrols in the space of fifty yards yet other busy roads have none – but it would also mean that areas, such as big new housing developments, might get a Lollipop at last. That would be fair.But the Lollipops campaign focused on only a small slice of the cuts, just one seventieth. Other campaigns to save concessionary travel or school buses or community transport schemes are still going on. Come the summer, people will ask why grass verges aren’t being cut and, come next winter’s first bout of snow, why their grit bins are empty. These are all tips of a very big iceberg. What most of us won’t see are the cuts in social care or support for people with disabilities or vulnerable children. We won’t see staffing cuts, so-called “back office”, until we wait longer to get responses to requests or complaints or reports of things that need fixing. The impacts of these cuts will be felt for a very long time – and our Conservative MPs have just voted for even more. The debate around the future of School Crossing Patrols has highlighted just how much visible public servants are valued by local communities. These men and women don’t just provide safe crossing points for our children, they also act as eyes and ears for local people, picking up on other issues such as safeguarding or crime concerns. In this respect, the outcry over the possible axing of funding for “lollipops” is a sign that residents are getting more and more anxious about the loss of visibility of a whole range of public services, whether police personnel, community safety wardens, parking enforcement officers, even street sweepers. Council staff are being erased from our streets and we are losing the very people who fly councils’ flags, day in and day out. It’s having the effect of raising community fears and reducing community resilience and cohesion. Some might think that’s overstating the case: I don’t.I was talking to a trade unionist this week about the RMT Union’s “Keep The Guard on the Train” campaign. It’s exactly the same issue. Guards are there to respond to emergencies, yes, but also to tackle and inhibit anti-social behaviour, to help people in need whether a parent with a pushchair or someone in a wheelchair and to improve security both directly and indirectly as a trusted person to call on. We all need someone to ask for help at times. There are precious few of them around anymore.As for School Crossing Patrols, the County Council’s suggestion is that schools and parents could raise money to pay for them by Bring and Buy Sales, Karaoke nights, raffles or “Cake Sale – everyone loves cake!” (sic). Exactly how many rock buns and fairy cakes will pay for a crossing patrol, this month, next month, next and every other year? And why stop there? How many raffles to pay for a police officer, a nurse, a soldier? It’s patronising nonsense and the endgame will be that affluent areas will be obliged to pay for services that less advantaged areas, who perhaps need them most, can’t afford. And we’ll all be worse off if we allow this to keep happening. Austerity isn’t over. Not at all. In fact, the crumbs of comfort that the Chancellor offered to local Government in the Budget are more than wiped out by the cuts in Government funding for this next financial year. The proposals for a further £35m cuts put forward by Staffordshire County Council therefore still stand unless the Council gets an injection of additional cash in next month’s financial settlement – or we use our political muscle to change things.For starters, the cuts propose the loss of all school crossing patrols across the County. Surely, the safety of our school children shouldn’t be compromised. Have you lobbied your County Councillor yet about this?Then, there’s the proposed loss of travel concessions for young people and older people. Those who use public transport and rely on it for getting to work, education, socialising, shopping or simply staying independent are going to be hit hard. The loss of support for local community transport schemes will add to people’s travel misery: how will they get to medical appointments? So far, I’ve had a number of individual County residents and community organisations contact me about the impacts of these cuts. But not many. Did you know about them? Have you made any noise yet?If people are not yet aware of the proposed cuts, they certainly will be when we get a spell of severe winter weather as grit bins will remain unfilled. Next year, they will notice that grass verges aren’t cut and weeds in gutters and on pavements aren’t treated. They will also notice when the cuts to “back office” mean that they have to wait far longer for answers to their questions or requests for information, the payment of invoices is delayed or complaints take longer to be resolved. It’s too easy, to talk about cuts to administration as though they have no effect. They do. So please use your political muscle: contact your County councillor, your MP, even your District or Parish councillors if you’re concerned and ask what they are doing in the face of these further cuts to services. It’s not too late, but it soon will be. It suddenly feels like autumn. Those “endless” school summer holidays have come to an end, much to the despondency of many pupils, and their teachers. I wish them all a happy and successful new school year.For some families, though, back to school means back to a proper midday meal for their children and it hasn’t come soon enough. Holiday Hunger for children, particularly those of primary school age, is a relatively new expression but the reality of not having enough to eat has been around too long and is growing year on year. This summer, foodbanks across Staffordshire were crying out for residents to donate extras to their local foodbanks in order to cope with demand. Many did, thankfully. However, the Trussell Trust which runs over 420 foodbanks across the UK including locally, estimated last year that one in eight children are left hungry during the summer holidays and that one in five families struggle to put enough food on the table. They anticipated that this would increase this year. What a shocking indictment of our country!All of this, of course, affects a child’s education too. Holiday Hunger can impact on a child’s growth, development, health and wellbeing. It is no wonder that the life chances of children at the lower end of the socio-economic scale are limited from an early age and their potential diminished. Goodness only knows what it feels like for families, ordinary mums and dads, to carry the stigma and guilt of knowing that they cannot put enough on their table to feed their children properly.This year, I know that lots of numerous voluntary and community organisations in Staffordshire, as elsewhere, have opened their doors to feed families and children during the summer, often providing entertainment and activities in an inclusive way at the same time. This can’t continue, though, and Government must act to find a solution to holiday hunger and, indeed, hunger at any time of the year. Foodbanks and summer holiday lunch clubs can not and must not become a substitute for a decent living income for all families. I’m a pragmatist rather than a purist. I’m probably far too impure in my political beliefs for some but I like to try to find practical solutions to problems and, by doing so, make a difference to our communities. That often means working with people from different political parties towards shared goals. I make no apologies for that. I’m not a Cooperative, as well as Labour, councillor for nothing. It’s struck me recently though how resistant councils can be to working together in the true spirit of partnership to address community needs, often (usually?) councils of the same political stripe.Everyone knows that County Councils like Staffordshire are under huge financial pressure, mainly because of the ever-increasing demand for social care for adults and children, our most vulnerable residents and neighbours. District and Borough Councils are also under financial pressure. Parish councils may think they are under pressure but, in reality, they aren’t. They are the only tier of local government which is not capped to restrict the level of council tax they levy and so have the ability to raise funds to do the things that the community they represent actually want.Too often, I hear the words “cost shunting” as top and middle tier councils ask parish councils to take on more responsibilities. I’m not an apologist for austerity cuts but, if the services under threat really are valued, why shouldn’t parish councils take up the mantle and provide them? Surely, that’s what we’re all about as councillors, providing services and support for the things which our electors think are important. It’s simply not possible for top and middle tier councils to carry on as they are but I really can’t understand why Parish Councillors refuse to take on some highways responsibilities or maintenance of parks and open spaces or the provision of leisure opportunities or street cleaning. These all make such a difference to the quality of residents’ lives and are not statutory services so, come on Parish Councils, think a bit more creatively about what you can do for your residents rather than chiding your bigger brothers/sisters. Small can be beautiful. preservation. Would the sky fall in if we lost one complete tier of councils? Not at all. Staffordshire County Council, like all local authorities across the country, has been faced with swingeing budget cuts from central Government, all in the name of austerity. This budget-making round has been challenging – a euphemism, if ever there was one, for nigh on impossible. Other sources of funding for councils such as retaining all business rates raised within their boundaries or payments for each now house built via New Homes Bonus are still not fully developed. The Government is deaf to all this. That leaves the County Council leaders, like others, scratching their heads about how to balance their books over the next few years especially as demand on services rises. It also leaves them with little option but to raise council tax for residents to the maximum level allowed (or almost the maximum: no-one is really fooled by the 0.05% below the limit any more than we’re fooled that £5.99 is a far better bargain that 6 quid). Therefore, the Conservative administration at the County Council voted through a 5.95% increase this week which Labour councillors opposed.We opposed the increase, not because we don’t value public services and public servants, not because we don’t welcome the commitment to ensure that vulnerable adults and children will be a priority, not even specifically because the budget was based on an assumption of 0% inflation but because the transfer of the tax burden from national to local taxes is unfair, unsustainable and takes no account of ability to pay. I described the budget as fragile, risky and vague. The words “fragile” and “risky” were echoed by two senior Conservative members. It’s vague on where further cuts will fall. Words like “review ”, “reorganisation”, “renegotiation” are supposed to realise savings but there is no detail about how – or the impacts on the residents of Staffordshire. The devil is always in the detail.And what about the much-vaunted extra £5million to repair potholes? That would be fine if it wasn’t based on a cut of well over half in next year’s Highways budget, from £52million to £22million. Tomorrow, it seems, will have to look after itself. On the day that the report on Sexism in Parliament has been published, I’ve been spurred on to push for more visibility of this issue at both Lichfield District and Staffordshire County Councils. It certainly exists. It drives me mad. Here’s just one example: as Opposition Leader, I’d had a go at a Committee Chairman that he wasn’t doing his job properly and that he should be doing more than simply chairing the periodic meetings; in effect, that he should do a lot more work between meetings to actually earn the extra cash he gets in allowances for the privilege. He couldn’t answer my question and was completely flustered in the public arena of the Council meeting but came up to me afterwards, smiley smiley and wagging his finger in a mock telling off, and said, “You little minx.” I was nearly apoplectic. Not only was he showing contempt for the Labour Opposition view, he expressed it in appallingly sexist language. I gave him an appropriate response. And it’s not just Tories. When I became Leader of the Staffs County Labour Group, two women put themselves forward as Deputy Leader. Oh my goodness. The reaction from some of the blokes, the Labour blokes! “We can’t possibly have a woman Leader AND Deputy.” Strange that they had never raised any concerns about having male Leaders and Deputies for the aeons before.I’m also keen to raise awareness though of the sexism in the Party and it was good to get unanimous support for challenging sexism in the Party from all members at a recent CLP meeting. But is it translating into any real impact? Do we all do enough, male and female comrades, to call out sexism? Is sexist “banter” outed in Branch meetings or more widely among members? Sadly, I don’t think so.As Party members, we all believe in equality, don’t we? As Party members, we’d all challenge racist or homophobic comments, wouldn’t we? We will do all we can to support people with disabilities, won’t we? But do we do enough to challenge sexism or, indeed, its ugly sister ageism? Sadly, I don’t think so. Yet. For anyone involved in Council finance, this is a pretty frenetic period as Councils prepare their budgets for the next financial year starting in April. In the run-up to Christmas, we wait with bated breath to find out from Government how much – or, more frequently, how little – support Councils are going to get and, it’s fair to say, there are usually some positives among the negatives. However, when the negatives keep outweighing the positives, it’s clear that more cuts to council services are on their way. That’s been the case for too long now under the banner of Austerity as councils’ funding from central Government is cut year on year on year with more to come. We ain’t seen nothing yet.I’ve heard it said several times now by leading councillors that people don’t like paying taxes but I challenge this assumption. We certainly need to bust the myth that you can have good public services without paying for them. Just look at what’s happening in the NHS now. From my perspective, national taxation based on income is the glue that binds society together. It’s a mutual insurance cover that means services such as health or social care are there when we need them and we can be thankful for our good fortune if we don’t. “From each according to his (or her, I might add) ability, to each according to his (or her) need.”As funding from national taxes is taken away from councils, councils have again been given the opportunity to raise council tax by a bit more. But this is the most regressive and unfair form of taxation as it’s based on the value of your home rather than your income. On top of that, we are being asked to pay directly for more and more services that we have previously paid for through tax and it’s those least able to afford it who are hit hardest. As someone has just said to me in relation to a further round of impending cuts to library funding, “Here we go again. Pay more, get less and blame the old”. What’s the biggest challenge facing our country, and our County, today? Given the potential impacts on all of our lives, I suspect that many people would say Brexit. Others would perhaps refer to housing, terrorism, climate change, education or something else – or all of the above.For me, the biggest issue is demographic change which has seen life expectancy rise since 1950 from around 67 years to almost 82. These are just averages, of course, and we all know people who are well into their 90s or have passed their century. This is the good news and testament to the success of advances in heakth care particularly. However, the bad news is that more people are spending their late life in poor health, disability, mental and physical frailty.We all look to healthy old age contentedly watching our children and grandchildren flourish – like in the Werther’s Originals advert. 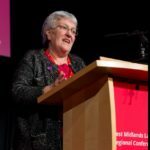 It’s much more uncomfortable to think about impairment, immobility, incontinence and increased dependency on social care for older relatives, let alone for ourselves.The County Council spends 70% of its annual budget on around 2% of its residents, the most vulnerable and needing care including the frail elderly. To manage its budget, the Council recently changed its contracts with home care providers. On the face of it, this helps to balance the books but the changes are causing a great deal of anxiety for some home care users and their families. It’s also bringing job uncertainty for hard-pressed care-workers. Unless we are directly affected, we don’t see these problems, unlike roads needing repair or libraries reducing services or charges increasing as well as council tax.The Council has recently been congratulating itself on “spending a record £300 million” on “providing three million hours of quality care.” Do the math, as they say. Is this enough? Will it ensure quality? Really? There have been calls over many years for a national debate on the costs of elderly care but it’s now becoming critical. Honest discussions about the sort of care we want for older citizens and for ourselves and how we pay for it is long overdue. There’s been one thread to numerous conversations I’ve had recently with residents, community groups, council officers and others: transport. While Government and County Council leaders are engaged with big infrastructure projects like HS2 or trunk road improvements, the current consultation on bus subsidies is in danger of slipping under the radar. (Why do such consultations always seem to happen at holiday time, I wonder. )Whether it’s accessing leisure and employment opportunities for young people or enabling older people to remain independent by getting to shops or social groups, they need buses.For many, the loss of bus services will be cutting their lifelines. There doesn’t seem to be nearly enough joined up thinking or any real understanding of the impacts of losing bus services on those very groups of people where demand on public resources is increasing, the biggest headache for councils. If people can’t get to work, health appointments, community activities, to visit friends and family, they become all the more prone to health problems. In the end, this can lead to even more demand on public services. A vicious circle.Take loneliness, for example. Research shows that it can have as bad an impact on health as obesity, smoking, excessive alcohol intake or substance abuse. Loneliness increases the risk of premature death by 26%. It also increases demand on social care services.People tell me that getting on a bus and chatting to other passengers is an important part of their weekly routine. Apart from getting people from A to B, the bus services in themselves provide social interaction and can therefore improve an individual’s sense of wellbeing. One resident said to me, “It’s usually the same people on the bus I catch. We’ve got to know each other and look out for each other. We have a really good natter on the way and I look forward to my trip.” How much better to promote independence than dependence.You may, like me, be so used to getting where you want to by car that you rarely think about bus services. Please think again, not least as a tax-payer, and have your say on this important issue.